Do Memory CD4 T Cells Keep Their Cell-Type Programming: Plasticity versus Fate Commitment? Do the Microbiota Influence Vaccines and Protective Immunity to Pathogens? After an initial encounter with a pathogen, the adaptive immune system creates immune cells that remember the antigens on the pathogen and allow the body to rapidly mount a response during future encounters. Vaccines likewise generate immune memory, preventing the body from succumbing to potentially dangerous infections. Understanding the mechanistic basis of immune memory is therefore essential for designing effective vaccines. 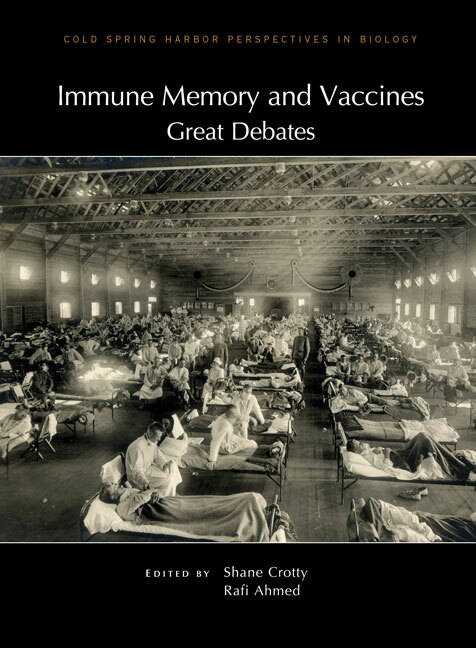 Written and edited by experts in the field, this collection from Cold Spring Harbor Perspectives in Biology focuses on the critical questions currently debated in the field of immune memory and vaccination. Topics include the plasticity of memory CD4 T cells, the formation of germinal centers by memory B cells, the contributions of natural killer cells to immune memory, and the influence of commensal microbiota on immune responses. Several contributors respond to each question, providing a variety of fresh, concise perspectives on each topic. Additional questions address the development and effectiveness of vaccines to various pathogens (e.g., dengue virus and Bordatella pertussis), as well as efforts to develop vaccines against cancer. This volume is therefore valuable for all immunologists, cell biologists, and medical scientists wishing to understand immunological memory, vaccines, and the implications for human health and disease. WHAT ARE THE PRIMARY LIMITATIONS IN B-CELL AFFINITY MATURATION, AND HOW MUCH AFFINITY MATURATION CAN WE DRIVE WITH VACCINATION? Is Affinity Maturation a Self-Defeating Process for Eliciting Broad Protection? WHICH DENGUE VACCINE APPROACH IS THE MOST PROMISING, AND SHOULD WE BE CONCERNED ABOUT ENHANCED DISEASE AFTER VACCINATION? IS IT POSSIBLE TO DEVELOP CANCER VACCINES TO NEOANTIGENS, WHAT ARE THE MAJOR CHALLENGES, AND HOW CAN THESE BE OVERCOME? IS IT POSSIBLE TO DEVELOP A UNIVERSAL INFLUENZA VIRUS VACCINE? If So, Is There Potential for Efficacious Microbiota-Based Vaccines? DO MEMORY B CELLS FORM SECONDARY GERMINAL CENTERS? WILL SYSTEMS BIOLOGY DELIVER ITS PROMISE AND CONTRIBUTE TO THE DEVELOPMENT OF NEW OR IMPROVED VACCINES? WHAT IS THE PREDICTIVE VALUE OF ANIMAL MODELS FOR VACCINE EFFICACY IN HUMANS? IS A HUMAN CD8 T-CELL VACCINE POSSIBLE, AND IF SO, WHAT WOULD IT TAKE? CD8 T-Cell Vaccines: To B or Not to B? Could a CD8+ T-Cell Vaccine Prevent Persistent HIV Infection? WHAT IS WRONG WITH PERTUSSIS VACCINE IMMUNITY? WHAT ARE THE MOST POWERFUL IMMUNOGEN DESIGN VACCINE STRATEGIES? IS THERE NATURAL KILLER CELL MEMORY AND CAN IT BE HARNESSED BY VACCINATION? Can Natural Killer and CD8 T Cells Switch Jobs?